The importance of a balanced diet and daily exercise was highlighted as Prime Minister Voreqe Bainimarama led the morning walk organised by the Westpac Banking Corporation in Suva. 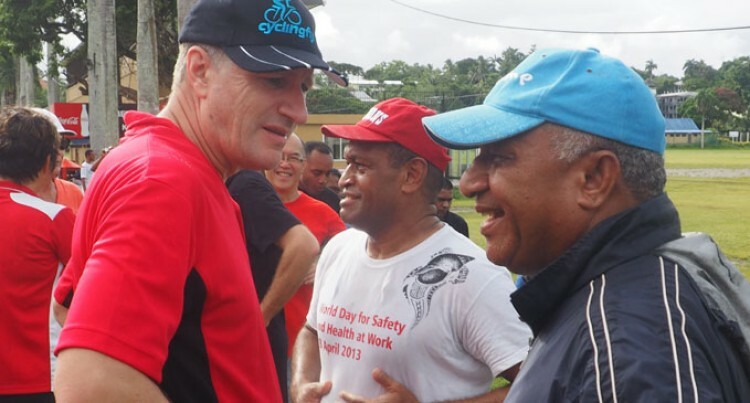 Hundreds, including bank staff and people from all walks of life, braved the drizzle and cold and joined Mr Bainimarama and Health Minister Jone Usamate for the walk yesterday morning. The walk started at 6.30am at Albert Park, Suva, along Queen Elizabeth Drive to the restaurant opposite Suva Grammar School and back to Albert Park. It ended at 7.30am. Those who took part then enjoyed refreshments provided at the park. Mr Usamate stressed the importance of the walk in the battle against Non Communicable Diseases (NCDs) in the country. “NCD is now a crisis in the Pacific and I believe that if we follow healthy lifestyle and one of it is through this walk, then we can be able to keep ourselves health and fit,” he said.